Keith Rowe | Weighing a pig doesn't fatten it. I’ve started this review three times, and always deleted what I had. This is version number 4. Not that this will be much better, but the only approach left to me is to start with stating how difficult this review is to write. There’s two reasons for that. 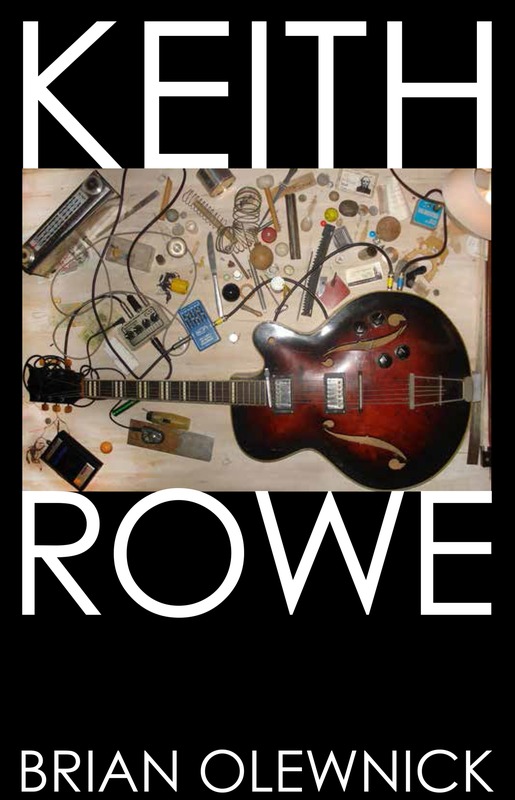 The first is that most regular readers of this blog are totally unfamiliar with Keith Rowe and his kind of experimental music, and I don’t really feel like writing a few paragraphs explaining it. Including links to YouTube videos might be an option – but Rowe’s is generally delicate music that doesn’t translate well via laptop or smartphone speakers, so I’m not sure that would convince anyone who’s not already into the fold. I will post a list of my 5 favorite Rowe albums after the review, should you be interested. While for some this might seem extreme music – both in its harshness and its silent, subdued nature – for me these albums resonate emotionally in the most profound way possible. The second reason is a gratitude towards both Keith Rowe and Brian Olewnick I simply don’t feel for any other subject or writer I’ve reviewed on this blog. Rowe is one of the very few musicians that changed the way I think about music, and the one that changed it in the most fundamental way possible. Dark Rags, his duo recording with saxophonist Evan Parker, truly was a gateway album that took me from jazz and free improvisation to another world entirely, a world I am still exploring more than 15 years later. Most of my other musical fads have faded long since – it’s only very occasionally I put on an album by Anthony Braxton, let alone one by Frank Zappa. Olewnick has been a guide into that world as well, as he pointed me in the direction of a myriad of other musical gems, via reviews on his Just Outside blog, and in the online community that once existed on the I Hate Music forum – in the days before Facebook and smartphones destroyed message boards. The importance of music in my life can hardly be overstated, and both Rowe and Olewnick have been key figures – so there’s the reason for a certain kind of diffidence, a trepidation that led me to delete 3 earlier versions of this text. First up: I want to express my gratitude to everyone who has read, liked, linked or commented. Thank you. My best wishes for the new year! I’ve read 54 titles in 2016, and reviewed 52. Below are the ones I enjoyed most, in no particular order. Click on the covers for the review. After the books, music. I’ve edited a bit here and there, but mostly these lists are like I posted them initially, and they serve as snapshots of an evolving taste. As you’ll see there’s lots of Erstwhile Records releases in the lists. The consistency of that label’s output is truly amazing, and probably unique in the world of progressive, experimental music. The lists focus on experimental – improvisational, “post-Cageian”, abstract, taomud, what have you – music on the one hand, and metal on the other, plus the occasional alternative, jazz or pop album. That would be about it. Not really thrilled (anymore) about anything else.